You know that feeling when your team’s ace striker gets around the last defender, sends the keeper the wrong way, and with an empty goal gaping in front of him, scuffs it wide. 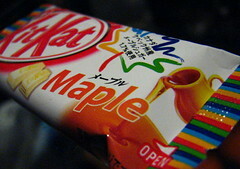 Meet the KitKat Maple. I’m not dissing the maple flavour. Far from it, it’s lovely. If only it had been milk chocolate. But of course it’s white ‘chocolate’, and a great goal-scoring opportunity has been wasted. This entry was posted in Uncategorized and tagged きっとかつ, キットカット, チョコ, チョコレート, メープル, biscuit, chocolate, cookie, japan, kit kat, kitkat, maple, white, 日本. Bookmark the permalink. I’d still like to be the keeper, but also reckon the milk chocolate idea would be rad.